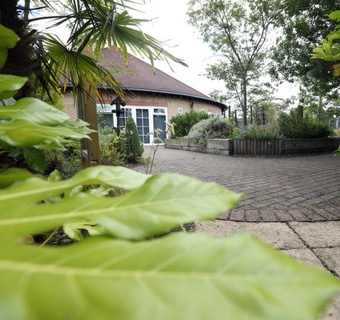 Butterwick House Children’s Hospice in Stockton on Tees provides respite care for children and young adults, some who visit for a day, many for a short break by themselves or with their families. 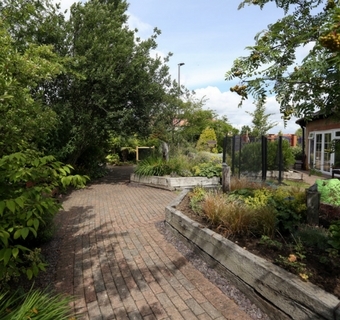 The tired outdoor space needed a complete refurbishment by Greenfingers Charity to create a new Sensory Garden to be enjoyed by the children, their families and staff who work at the hospice. The hospice’s wish list for their new outdoor space included a water feature and a safe play area for fun and games all to be incorporated into a colourful and scented planting scheme. 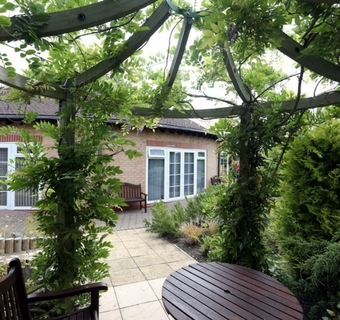 With support from The Garden Centre Group, and especially Stockton Garden Centre, the garden is now an inviting place for everyone at the hospice to enjoy. Volunteers started work in 2012 to clear the old garden space, removing the existing shrubs and repainting fence panels, before work could begin to transform this outdoor space which was officially opened in July 2013.
vegetables and mini fruit trees. A wisteria covered pergola houses a table and chairs and a water feature gives the garden a feeling of tranquillity and peace and one that can provide a place for relaxation for many years to come.